Do you want to send a message if so enter it here if not please enter none. Are you struggling to decide what to buy for the cricketer in your life, we have a great solution. 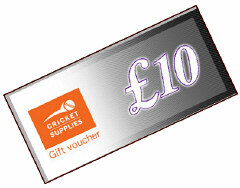 Buy gift vouchers for Cricket Supplies as a gift so they can decide for themselves. We sell the gift vouchers in £50, £25 and £10 values. We will print a voucher code onto your gift voucher, which can then be entered online to receive your money off. Please use within 12 months of purchase and note also please that no change is offered. Only one voucher / voucher code can be used / redeemed per online order.